In the winter market, Denis Suarez left Barcelona and signed for Arsenal on loan until the end of the season. Before the midfielder?s move to the Emirates, the La Liga winners wanted to include a mandatory purchase option clause, but the Gunners were unwilling to meet those demands. The north London club won the battle and as part of the deal, the Premier League side have an option to make Spaniard?s deal permanent for ?20m plus ?5m in variables. Since making a switch to England, the 25-year-old has made six appearances in all competitions, while he has yet to start for Unai Emery?s side. 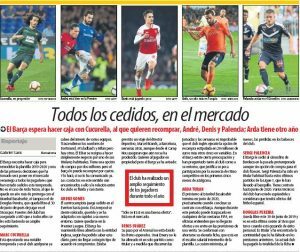 Wednesday?s edition of Mundo Deportivo takes a look at Barca players who are on loan and this includes the former Villarreal man. It is claimed that Suarez?s time at Arsenal is ?not giving expected results?, which is why it is ?unlikely? the English outfit will take the option of making his transfer permanent in the summer. The Blaugrana are concerned with the midfielder?s lack of playing time and have already contacted his entourage and Arsenal. They have received a response that he has not been used regularly at Arsenal because Ernesto Valverde hardly gave him opportunities in the first half of the season at Camp Nou, so it’s not thought he’s ready. It’s very early in this situation, and a handful of good performances, should he get the chance, will likely change everything for Denis Suarez.